Business marketing is the most important part of business. The marketing team has to be professional, well trained and motivated so that a company can progress exponentially. Business marketing helps a company to convert into a brand name. It strives for better business exposure and responsible for maintaining a good reputation among the clients or loyal customers. 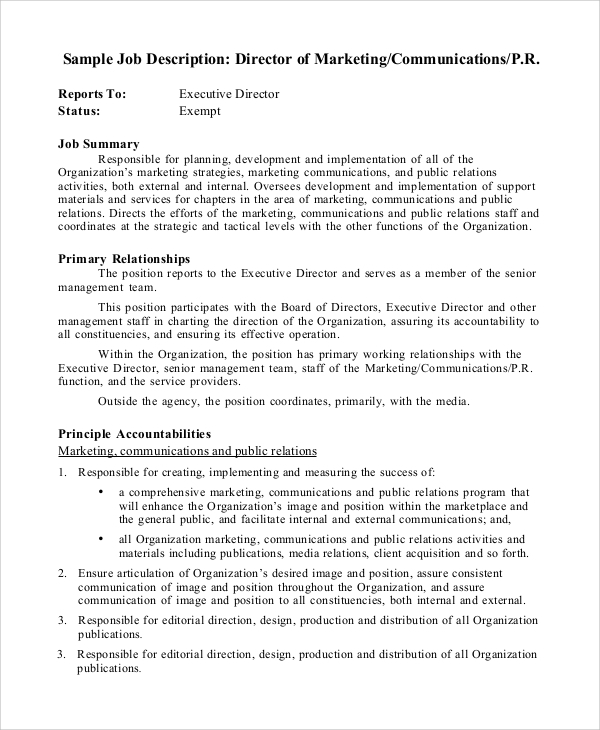 For a company’s marketing manager, a properly written job description is essential. Create a seamless Job Description Samples, following the online samples. The sales and marketing manager of a business needs to handle a lot of job responsibilities. For managing those responsibilities, there must be clear instructions from the business management teams. This is why sample job descriptions are required. 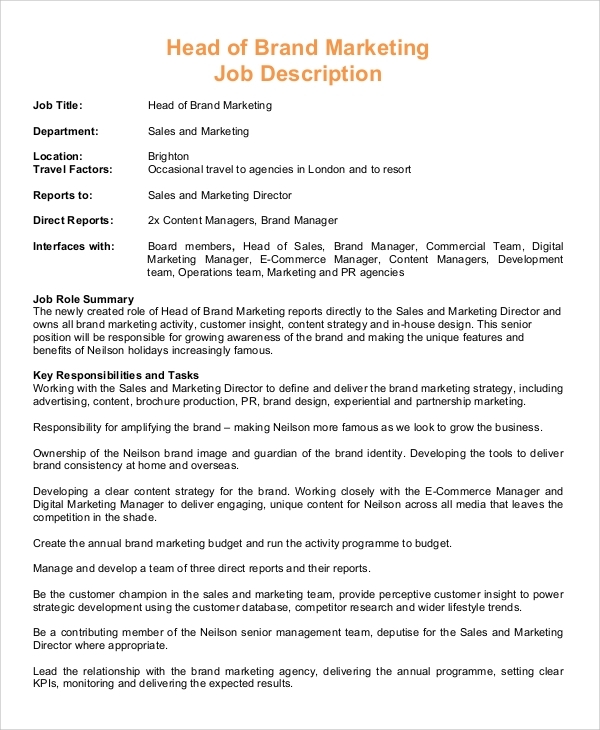 Writing a job description for a business marketing manager is not an easy thing to do. For doing that, you need to have a properly formatted job description. Use this sample for that reason. The role of an assistant marketing manager is as crucial as the role of the marketing manager. 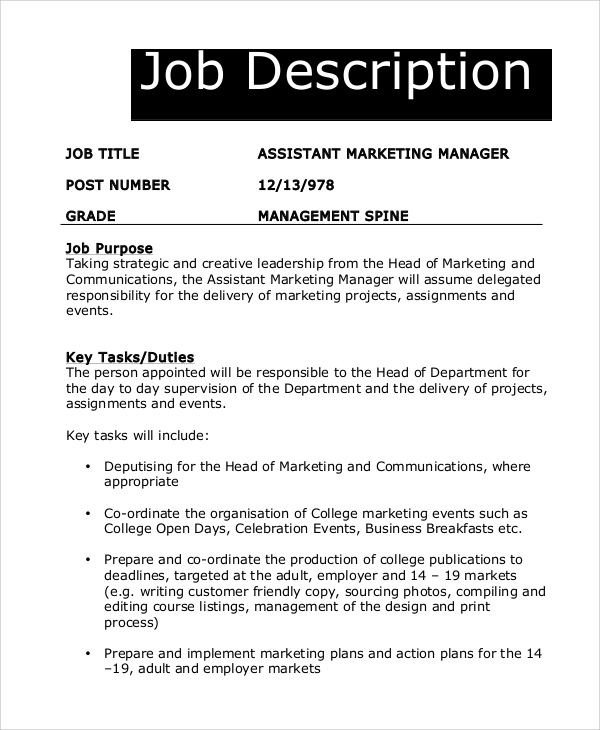 The job role and responsibilities of a marketing manager should be defined through a properly formatted job description. You can use this sample for this purpose. For sales of products and to enhance business profitability, marketing managers need to have properly crafted job descriptions. The HR managers should provide them with proper job descriptions, and they can use online samples for that reason. Marketing managers play a lot of important roles and responsibilities in an organization. 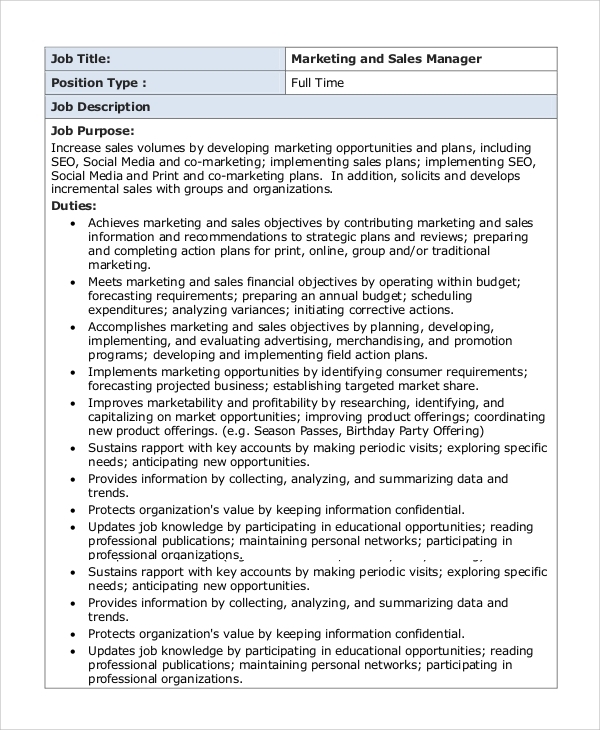 This is the sample job description that you can use for writing proper job descriptions for the marketing manager of a company. For creating a seamless job description, it is essential that you need to find proper job description samples. 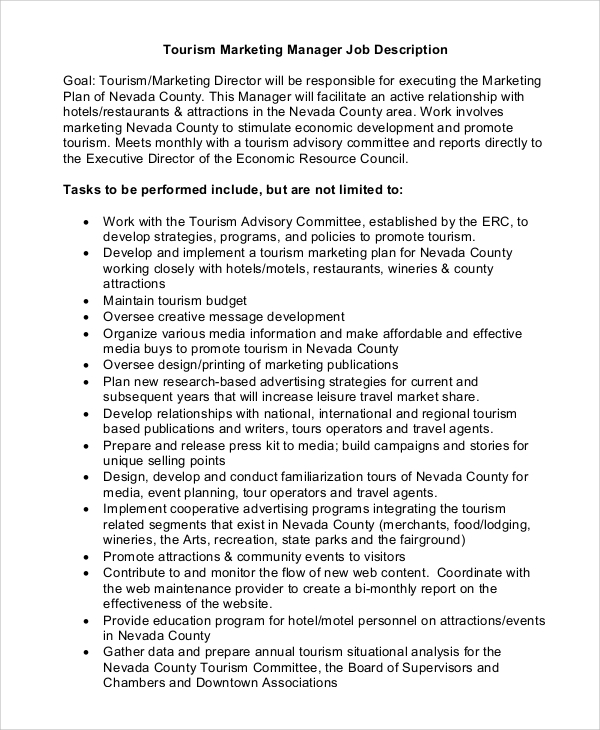 The business managers or the HR teams have to craft such documents with precision for their marketing managers. Online samples are available in various formats or structures. Download any desired format and use that for your purposes without facing any hassles. 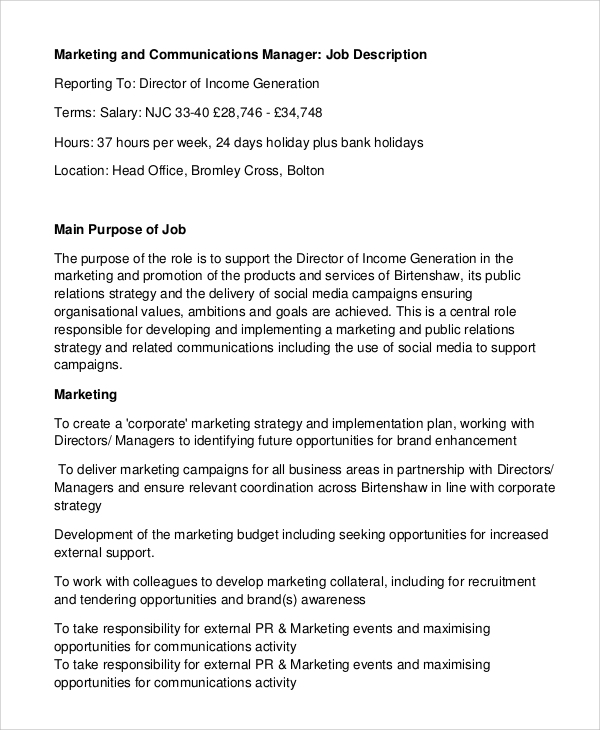 Who Should Download The Marketing Manager Job Description Samples? 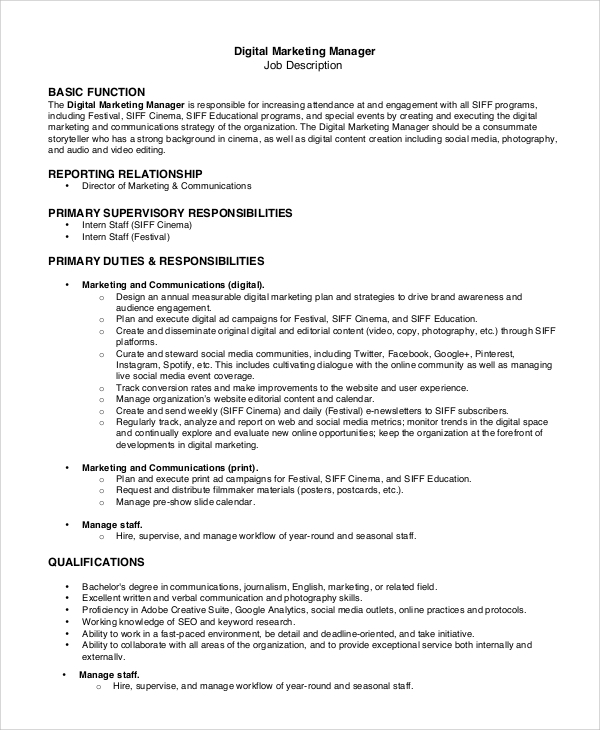 Job description for a marketing manager for an organization is essential for various reasons. First of all, to recruit marketing managers, it is critical that you create a job description. By reading the job description and the employer’s preferences, potential candidates may apply for the job. It helps to get more experienced and potential candidates for the job. 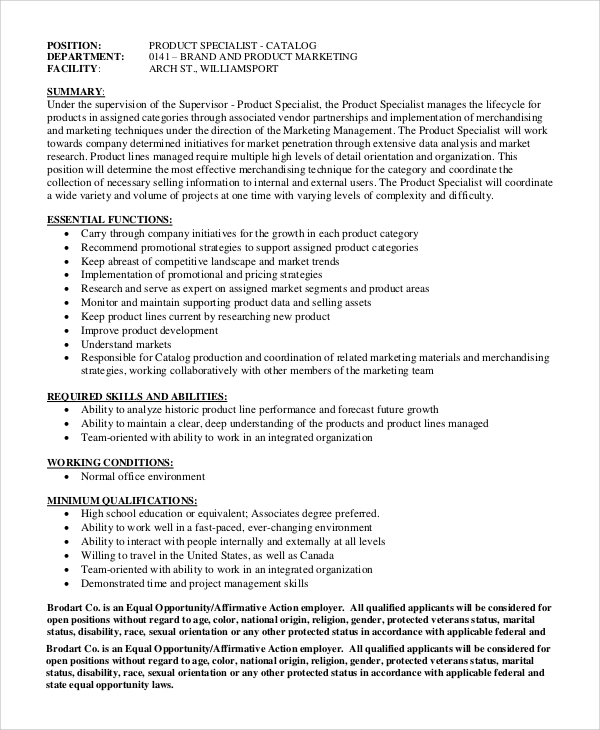 Business job description templates or samples should be utilized for the purpose of writing job description perfectly. 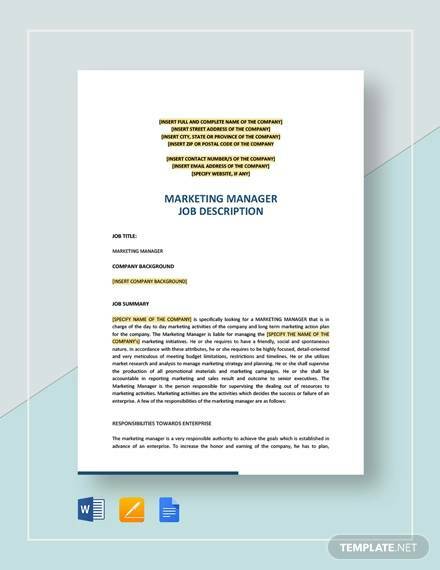 The business managers or owners or HR management staffs can write the job descriptions for the corporate marketing managers using the online samples. Different kinds of templates or samples are available online. Download them and print them to use.